So many of 2012’s finest acting turns were wired into ensembles (the squabbling families of and Tribes, the combatant couples of Virginia Woolf), but Shuler Hensley—literal centerpiece of Samuel D. Hunter’s stealthily surreal heart-burster The Whale—really is an island: a 600-pound isle of flesh. 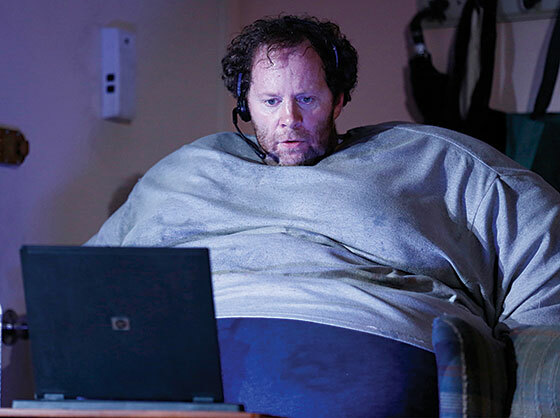 Inside a suffocating fat suit like his, an actor’s every movement counts; it’s like giving birth. Making this guy more than a stunt, and moving him beyond the merely literal, takes something approaching genius. Hensley’s Charlie—an online English-composition tutor steadily eating himself to death in an Idaho edge city—is both a compendium of insatiable American emptiness and an utterly honest, entirely non-bathetic hero. That’s no small thing.